The island of Cebu has a lot of natural wonders that serve as playgrounds for those with adventure in their hearts. Limestone cliffs, mountain ranges, coral reefs, waterfalls, rivers—you name it, we got it. 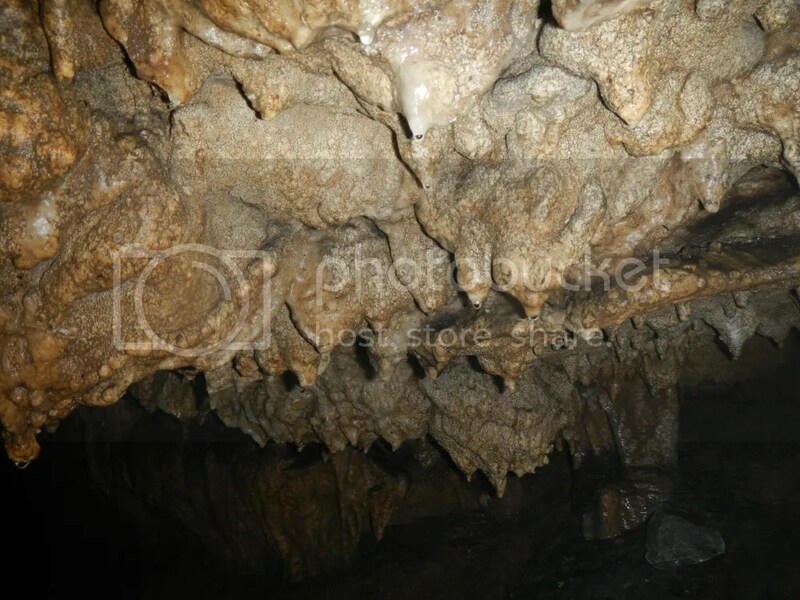 And, of course, Cebu is pockmarked with innumerable caves that are waiting for those who dare to enter into the world of darkness and into Cebu’s innards. 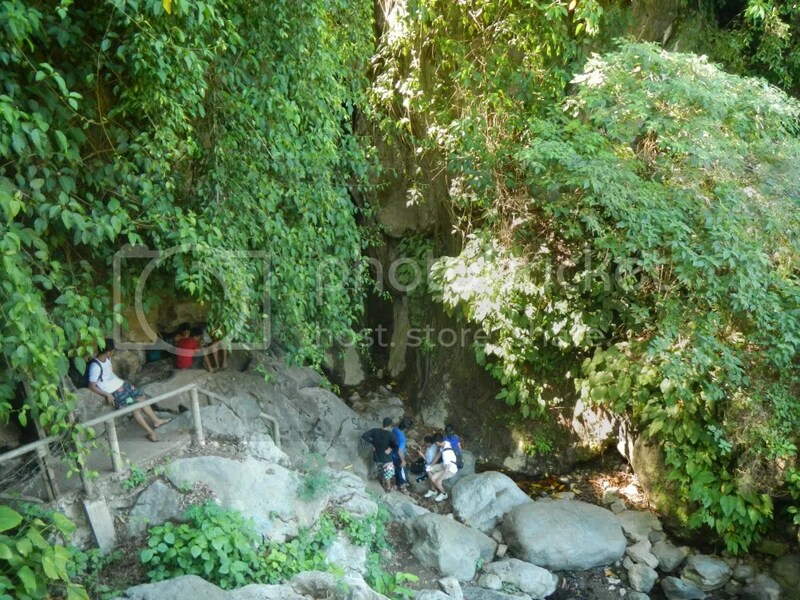 Ask local folks and they would explain in detail the secret story of the cave in their town, village, or baranggay. 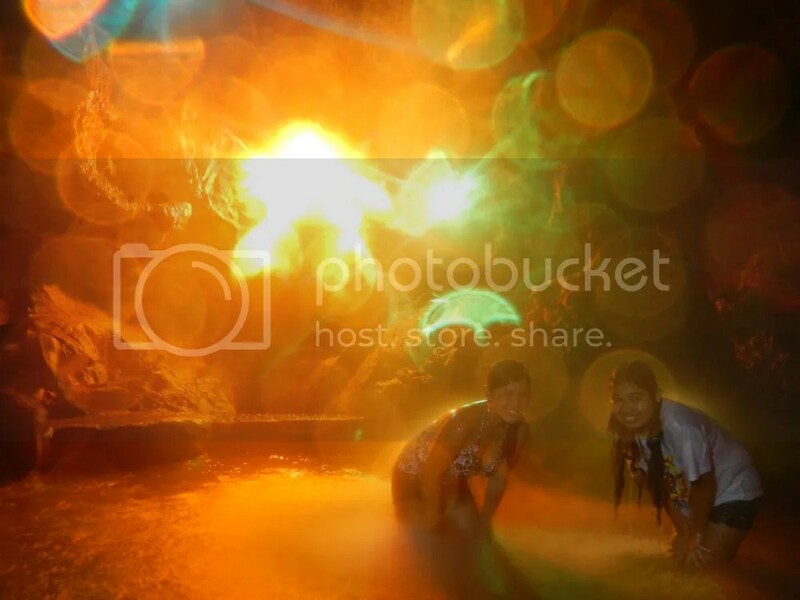 “That cave used to be the hideout of Japanese troops during World War 2” or “That cave is the haunt of the spirits of the dead.” Cebu’s caves have an aura of history and mysticism, which makes them all the more alluring to adventurers. Igotan Cave is one such cave. Tucked carefully in the baranggay of Jaclupan, the cave is thought to be the haunt of everything, from rebels hiding from government forces to enkantadas (fairies) who wish not to be seen by mortals. 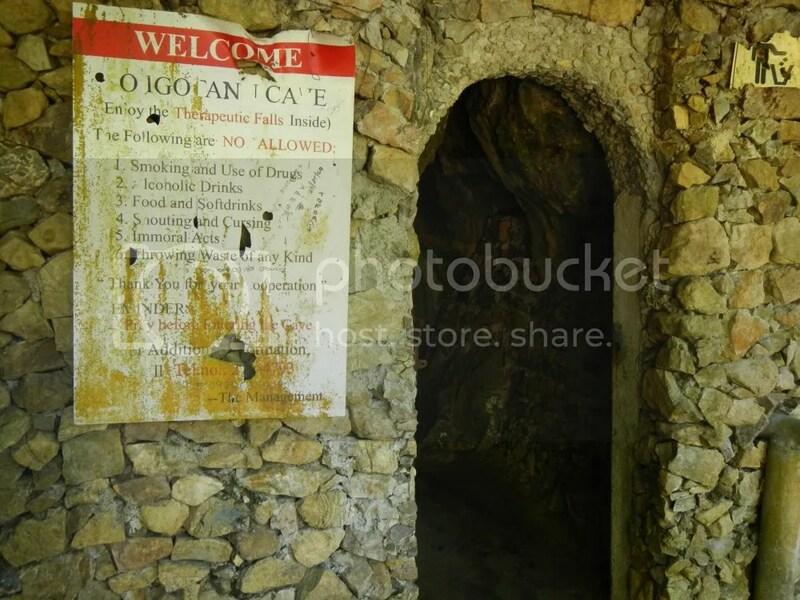 But one thing is for sure, Igotan Cave is a favorite of locals and visitors because of its so-called therapeutic falls. Thus, we rested for half an hour after our Quiot to Jaclupan trek and hiked towards Igotan Cave, which is just 15 minutes away. Along the way, we saw both virgin natural wonders such as cliffs covered with vegetation to evidences of man’s destructive tendencies. 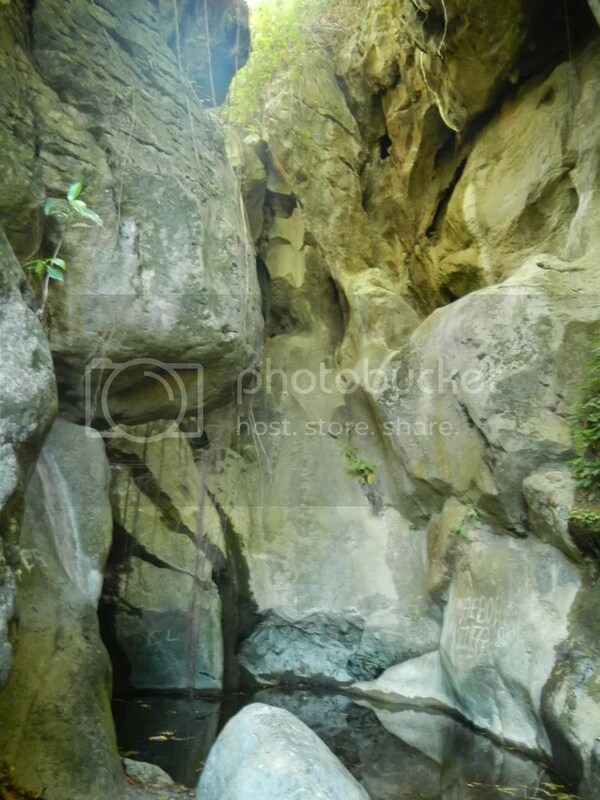 Igotan Cave is at the other side of the Mananga River. We had to cross it using this rusty bridge. 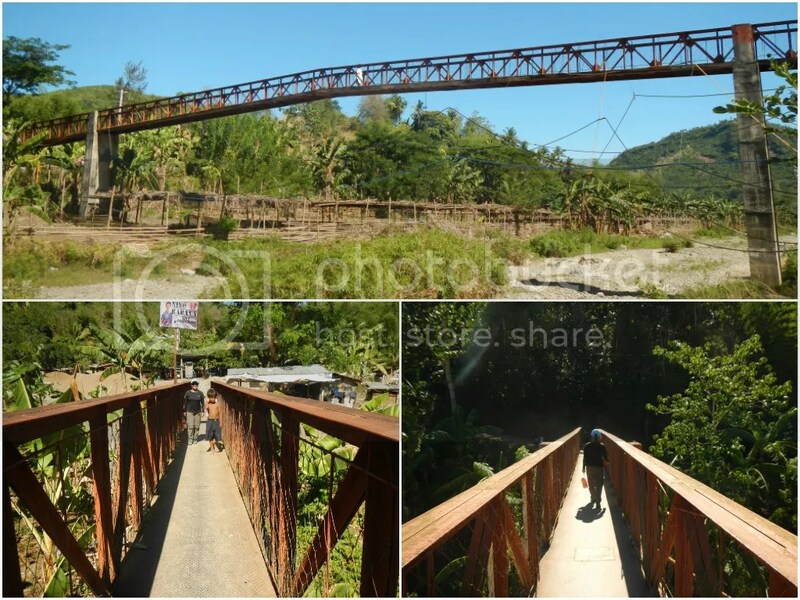 Locals also use this footbridge to carry goods from one side of the river to another. This is the result of man’s needs—and greed. 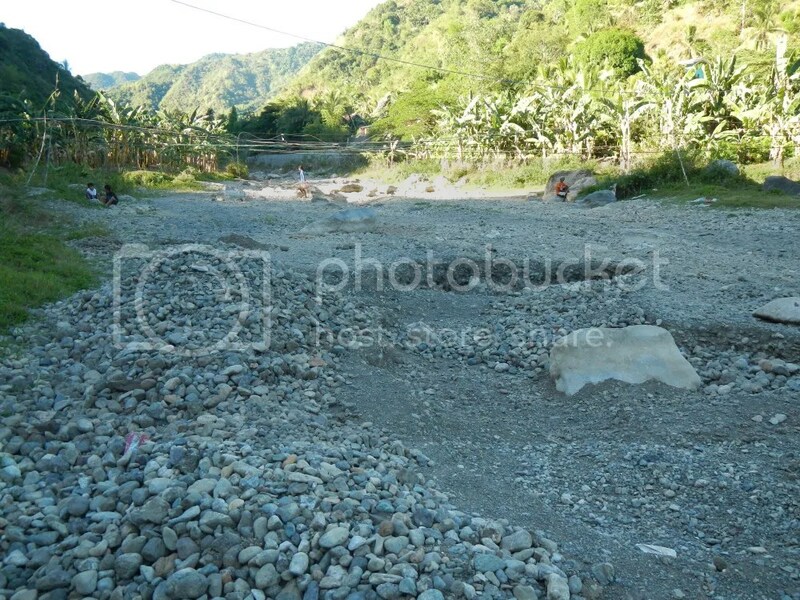 The Mananga River was once a wide, fast-flowing river that is almost similar to Cagayan and Davao Rivers. If our information is right, it was once the widest river in Cebu. Unfortunately, decades of quarrying, extracting gravel, and building dams have killed the river. Today, there’s nothing left but a trickle, a shadow of Mananga River’s former glory. And in some places, that shadow is non-existent at all. A short trail to the right of the bridge led us to the entrance of Igotan Cave. Nope, that’s not Igotan Cave. That’s a dried-up waterfall beside the cave itself. Locals usually take a bath in that waterfall on hot days. 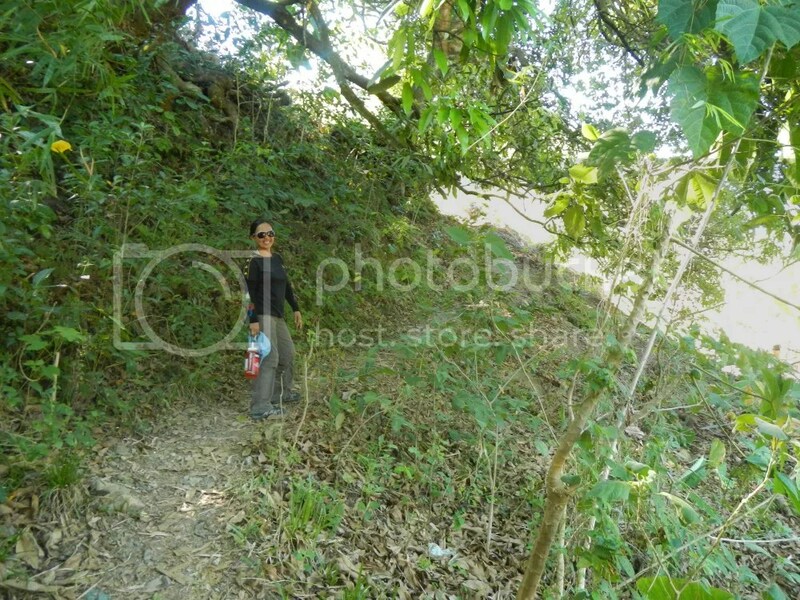 The presence of pipes also suggests that this place is a water source for the community. That’s the dried-up waterfall up close. During wet season, there must be a strong column of water cascading down these rocks. Sadly, you can also see glaring traces of irresponsibility and carelessness in the form of ugly graffiti being scratched into the rocks. It will take eons before those traces of vandalism disappear. The whole place also has the faint but unmistakable waft of human excrement. Personally, we would never take a bath here although the rock formations do look awesome. Above the waterfall is a platform that serves as a viewing deck and a waiting area. 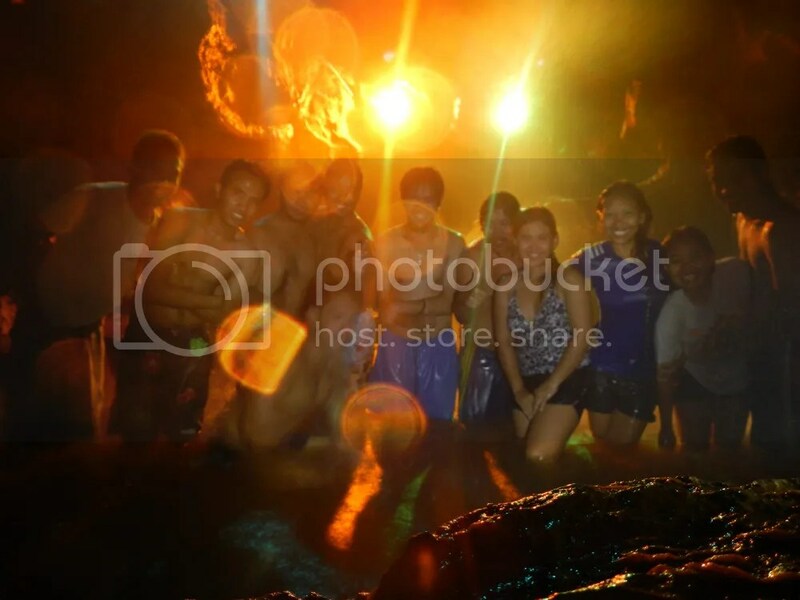 After changing to our bathing suits and trunks and paying the entrance fee, everyone was ready to go inside Igotan Cave. Read the rules first before entering the cave. Sweetie led the group inside the cave. Urban folk tales tell the story of a man who lived inside the cave in his lifetime. Not wanting to face the outside world for reasons he only understood, he just explored the many tunnels of the cave until he never found his way out again. We were still just a few yards from the entrance, and we were already crouching and squeezing in tight spaces. Yes, that’s water flowing at Sweetie’s feet. Uhmmm, Sweetie, I think that’s the wrong way. Hehe! We actually got a bit lost here. Sweetie volunteered to check out the passage because she is small enough to fit through. After a few minutes of rechecking the tunnels, we found ourselves back to the right track. 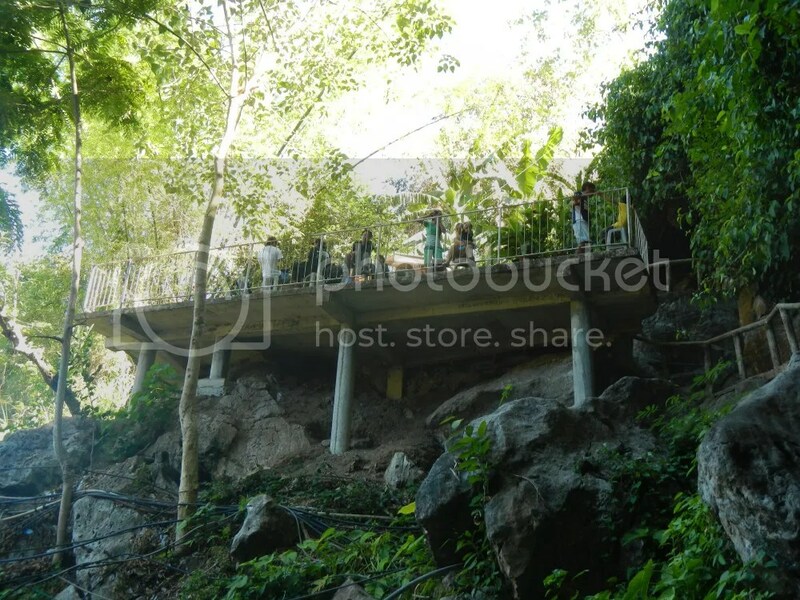 From here on, it’s a relatively easy and short trek to Igotan Cave’s highlight. 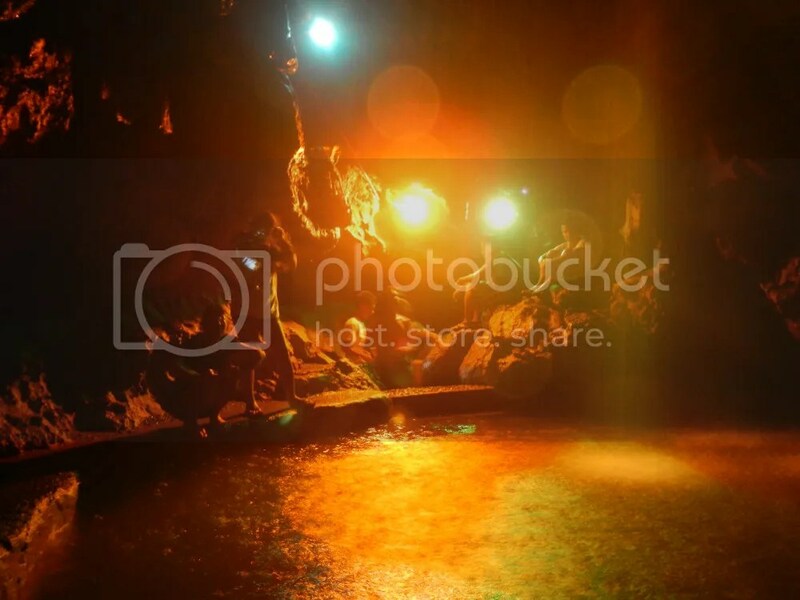 A few minutes of walking in darkness, we finally reached Igotan Cave’s gem, this cool pool of water fed by, believe or not, a waterfall inside a cave! It’s a bit faint in the photo below due to the darkness, but if you look closely, you can actually see the stream of falling water. That’s the source of the waterfall. Don’t let the photo below fool you; that’s really A LOT of water falling down. To let you have an idea on how strong the falls is, I turned on my camera flash. As you can see, I was cringing at the force of the falling water. Now, we understood why it’s labeled as “therapeutic.” The mighty force of the water actually massages your back. Yes, it’s Mother Nature’s very own masseur! The water felt so good that Sweetie and Angel stayed under the waterfalls the longest. They said that the waterfall massaged all their stress and body aches away. A group shot of the team enjoying the cool water. Oh, don’t worry if you don’t know how to swim. The water only reaches the thigh. We started the day bathing in sweat from an arduous trek, but we ended the day taking a relaxing shower and massage from a stream of pure groundwater. After almost an hour of allowing water to wash the sweat, dirt, and stress off our bodies, it was time to head back. And of course, it involved another round of crawling and bending over. By the way, see those red tubes? Those are electrical wires that power up the colored lights that illuminate the pool. Igotan Cave is a quite a small, short cave, but that doesn’t mean that it has less to show. 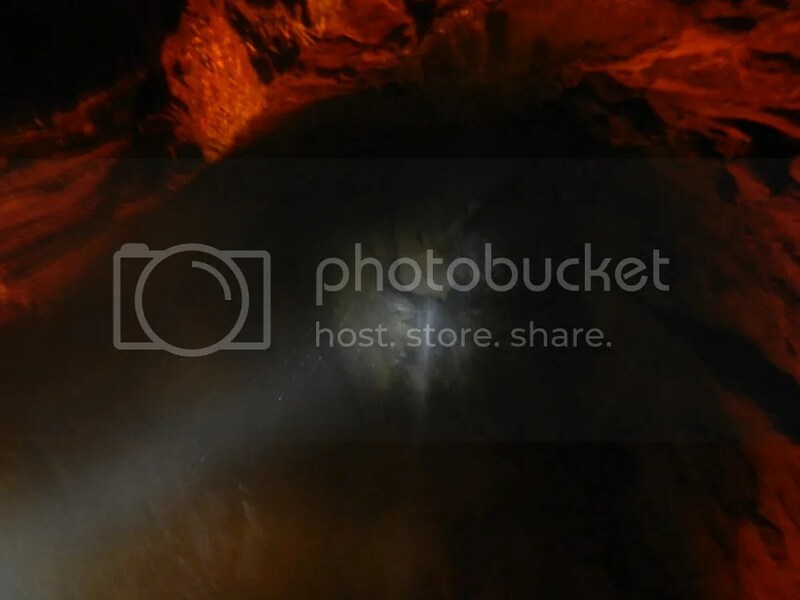 These amazing rock formations inside Igotan Cave didn’t fail to amaze us. 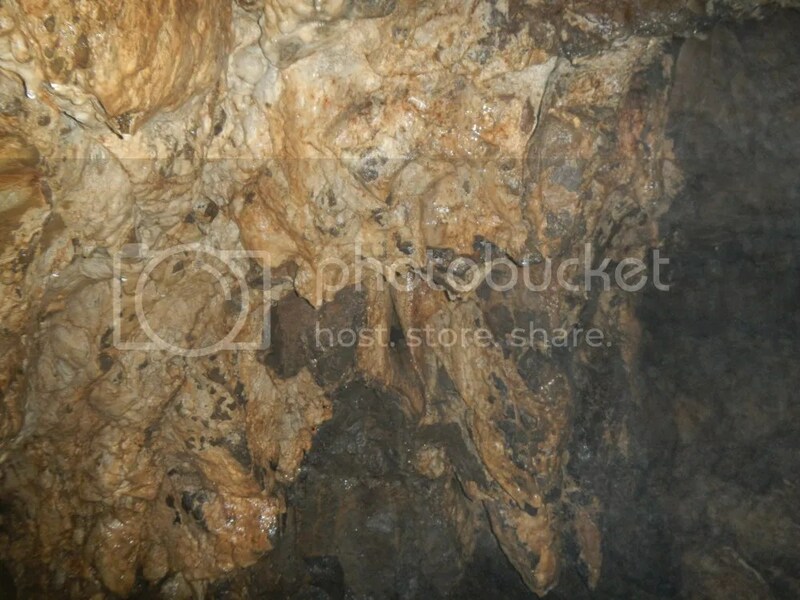 By the way, don’t be grossed out if the cave smells of urine. That scent comes from bat pee, and being in a cave, you shouldn’t be surprised at that smell or an encounter with a bat or two. On the roof of the cave are stalactites, with ground water dripping from them. Without human intervention, these stalactites will reach the cave’s floor after thousands of years. Considering the presence of water and the neat tunnel-like structure of the cave, Igotan Cave must be an erosional or corrasional cave. As the name implies, an erosional or corrasional cave is created when flowing streams slowly erode the bedrock until a cave system is formed. Yup, it was a pretty tight fit. 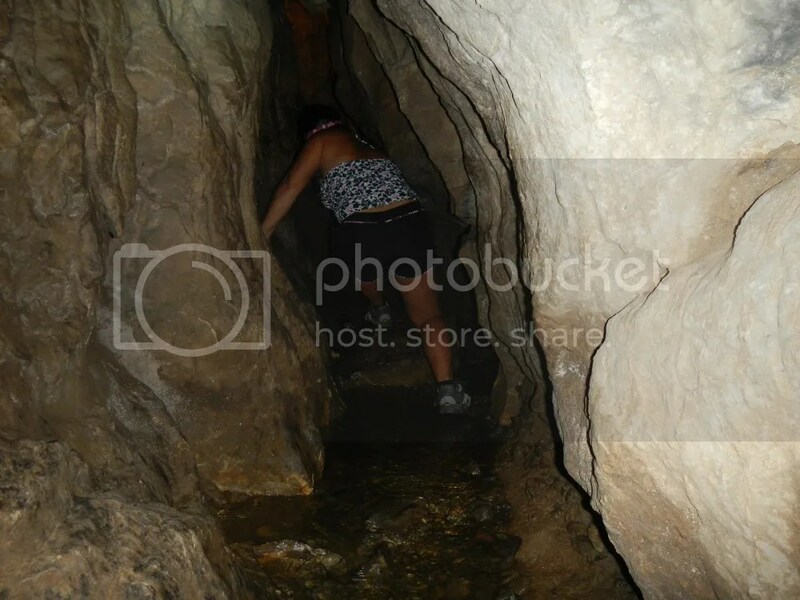 We had to do some twisting, bending, and crawling to go through some of the passages. After a quarter of an hour, we finally saw daylight. Wow! That was some adventure: hiking, climbing, river trekking, and caving all in one day! Congratulations to these adventurers! And of course, a huge thank you to Sir Sien for allowing us to explore your playground! ‘Till the next adventure! 2. 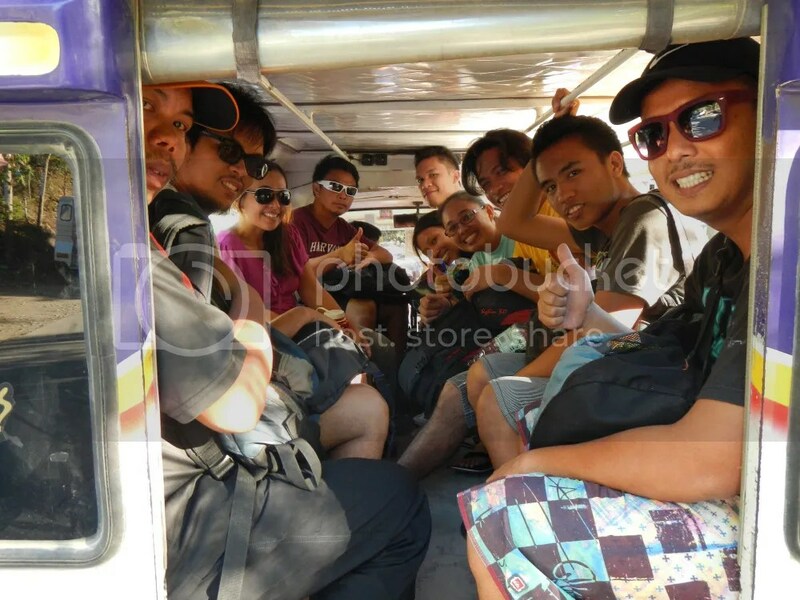 If you want to go to Igotan Cave directly, take a 41D jeepney at the Citilink Terminal heading for Tabunok, Talisay. Hike for awhile to Lagtang until you reach Rose Pharmacy. You will see habal-habal drivers stationed there. Ask the habal-habal driver to take you to Igotan Cave. Don’t worry, your habal-habal driver would most likely be familiar with the place. He will drop you off at the junction of the Mananga River. From there, just hike a little bit until you see a rusty metal footbridge that spans across the river. Cross the bridge then take the right trail. 5. The cave is pretty wet so waterproof everything that you want to bring inside the cave. 6. You can leave your stuff at the caretaker’s shack beside the entrance of Igotan Cave. The facility is rudimentary, so don’t expect anything more than two toilets and the shack itself. By the way, you can change into your swimsuit or dry clothes in the caretaker’s shack or the toilet. 7. 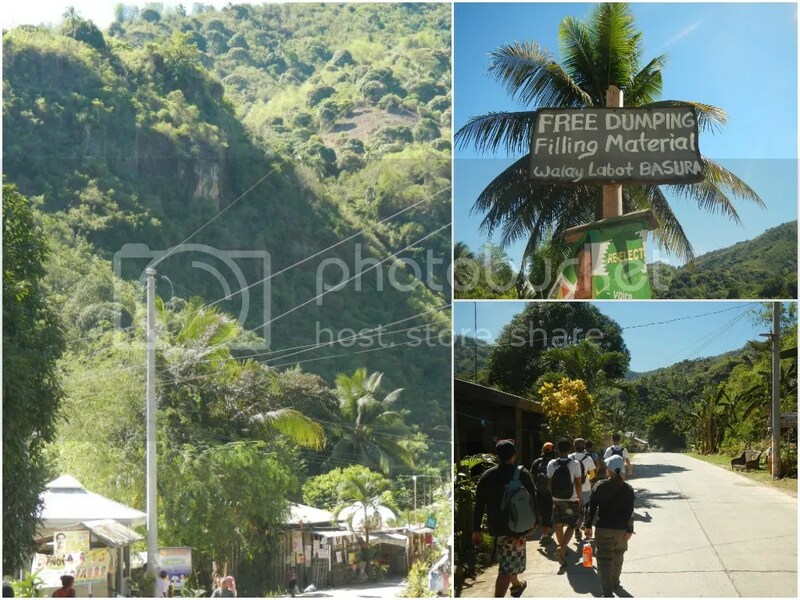 Be considerate to other guests who want to explore Igotan Cave. Don’t stay too long in the cave or linger under the waterfalls, especially if there are plenty of visitors. Better yet, share the cave and the falls with them. amazing!! 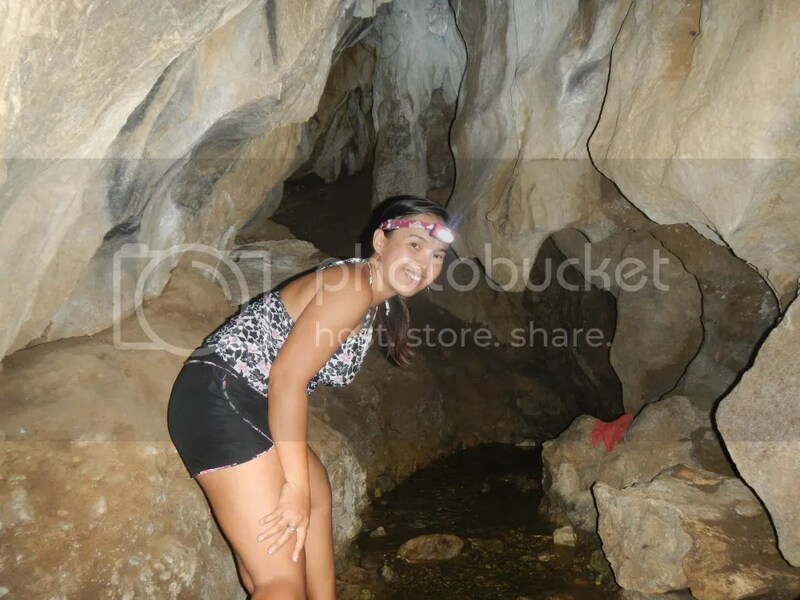 i didn’t know there was such a cave in cebu! but that waterfall in the middle! very nice!! do you have like an organization or just a barkada? nice kaayo! Hehehe! The wonders of Cebu! Amazing, isn’t it? Sheila and I belong to two organizations, Visayan Trekkers and Enthusiasts of Cebu Outdoors. But anyone is free to join us in our adventures. Thank you for visiting our blog. Sure, head out to Igotan Cave. You’ll definitely love the waterfalls inside it. Brod, Can I share your blog to my friends for our plan to visit Igotan Cave? Sure, sir. No problem at all. Wow! That’s a great suggestion. Do you have the phone number, email, etc. of a contact person there so we can arrange a visit? 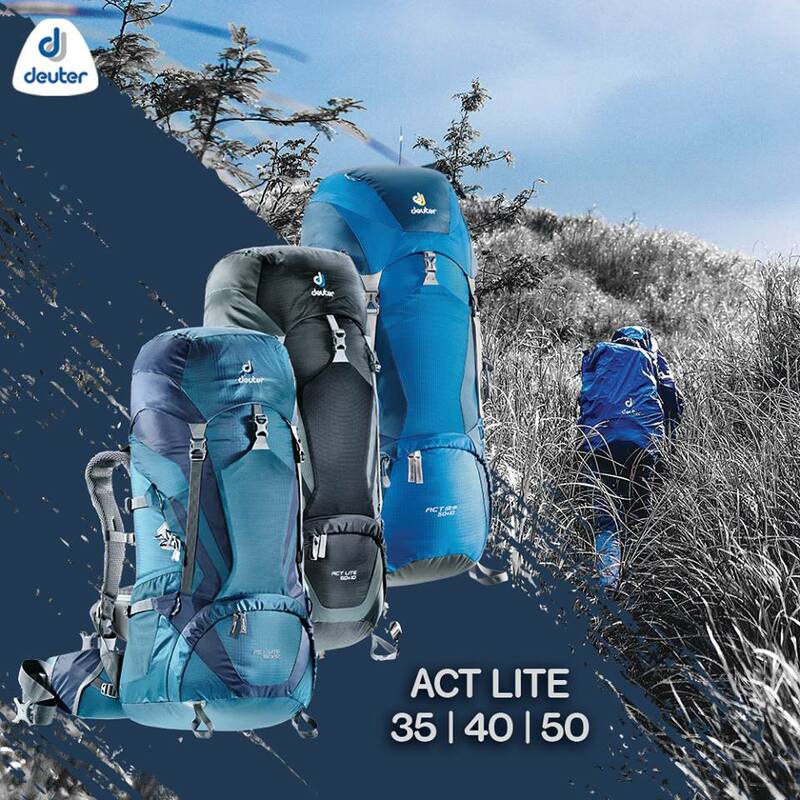 When will be your next adventure? Pwede mokuyog with friends pud? Super nice. Sure, no problem at all. You can get in touch with us through our FB page or email. We also strongly recommend you check our partner Outpax (click their logo on the sidebar). This is a social media platform where you can join and organize adventure events. There are plenty of adventures there that you and your friends can also join. 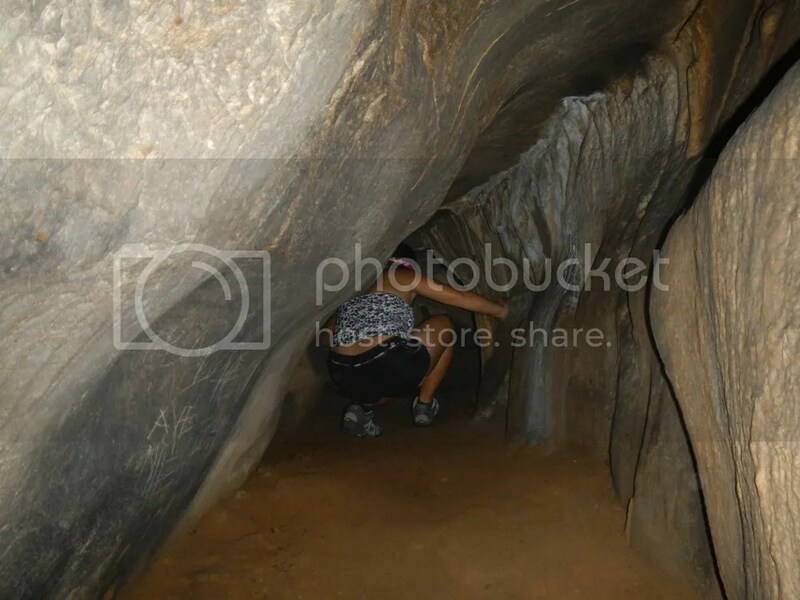 Thanks to this blog , I am really looking for a near cave since I haven’t tried yet . 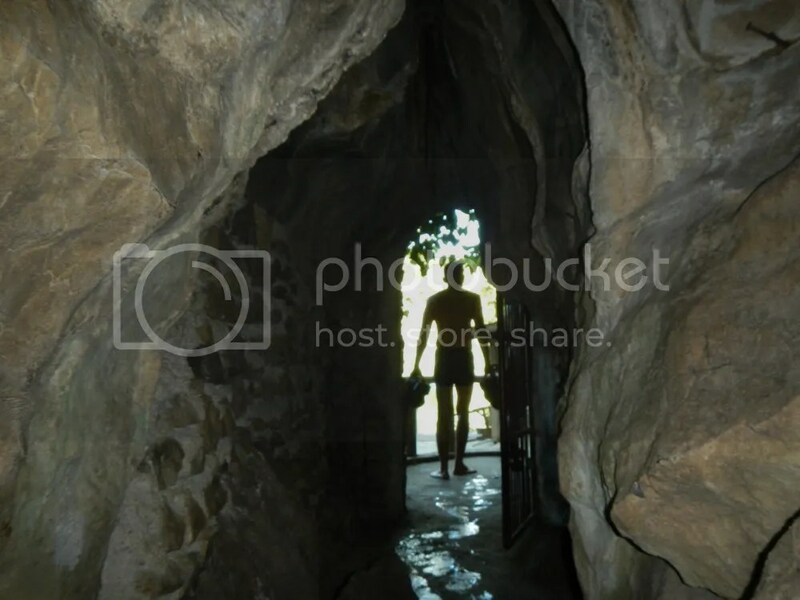 Is there a tour guide in going inside the cave? and how much the tour guide cost? so I could plot budget in going to Igotan. Igotan Cave is a show cave and self-guided. No need for a guide. But there’s an entrance fee of some sort. naay entrance ang igotan falls? Yes, it’s Igotan Cave. The falls is inside the cave.